Participate in the big COMPUTER BILD Netztest and help us to find weak spots in German mobile networks. Does your mobile data connection feel slow and sluggish? The COMPUTER BILD Netztest shows the real performance of your mobile network. In comparison the synthetic tests, the COMPUTER BILD Netztest measures the performance of your mobile network where you use it, with real devices and real data plans. Besides that you help COMPUTER BILD to set up a database for the quality of the German mobile phone network – so we can show the operators how good or bad they really perform. 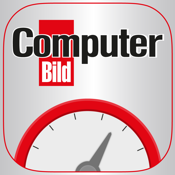 The speed test of the COMPUTER BILD Netztest shows you the speed and latency of your UMTS, LTE and Wi-Fi network on a speedometer, separated into upload, download and ping speed. After each test you receive an assessment of your result, comparing it to users in your region. So you can find out if you surf the net faster or slower than the rest of Germany. All speed tests are archived with all details and can be accessed anytime and viewed on the integrated map view. The archived data helps you to recognize speed variations quickly. Discover the reasons of bad network performance! The coverage map displays network availability depending on your current position. The network coverage of each provider is shown on the coverage map. This application does not store or process personal information like phone numbers, contacts or the IMSI. You can always stop the data collection by uninstalling the app.